Everyone knows that everyone on internet is obsessed with cats. There is a huge amount of cat-related content out there and we cannot get enough! 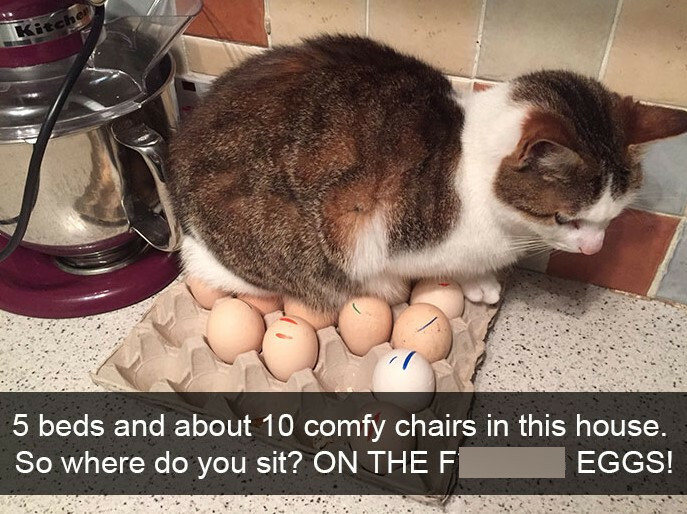 Having in mind that it is a favorite topic for most of us, we selected a funny list of snapchats featuring cats! They are definitely worth checking out because your mood will be improved instantly! Scroll down and have fun! Pet owners out there would immediately recognize this look. It says more than a thousand words and you probably guessed that these two were up to no good. Dogs always know that they are in trouble but they seem to forget because they would to the same thing again the next day. The curious part here is the presence of the cat. 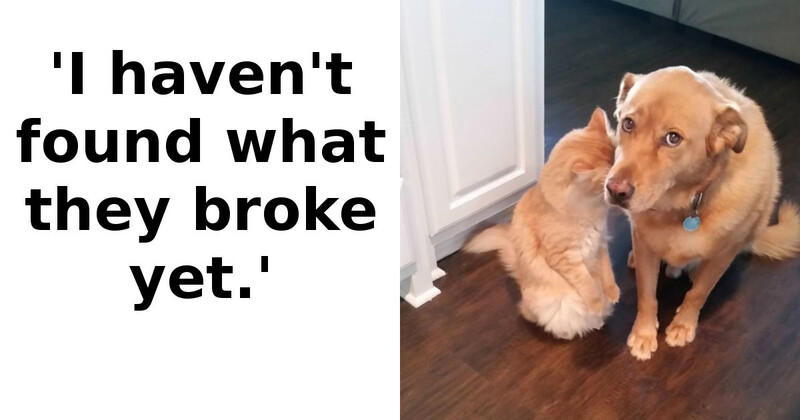 Felines have no shame at all and they do whatever they please with zero regrets afterwards. However, in this case the cat seems to be more ashamed than the dog! Cats can form strong bonds with people or other animals. Most people believe that only dogs are capable of such strong relationships but cats can be loyal as well. This particular cat proves it! The person who posted the photo explained that this handsome boy’s name is Ralph and he is very persistent at one particular thing. 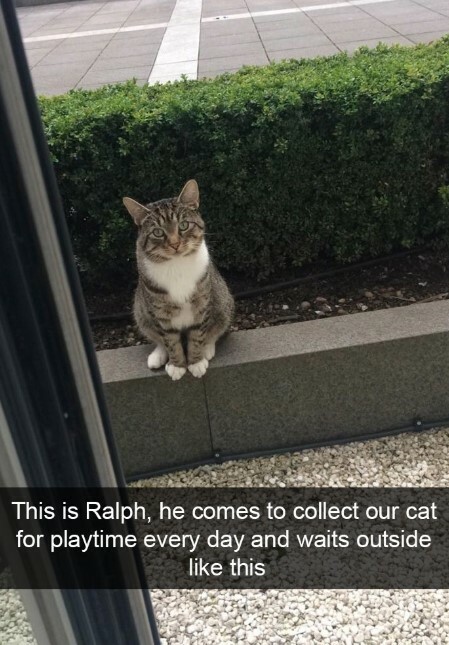 Ralph comes every day to this person’s house and waits like this for their cat to come out and play. How cute is that! 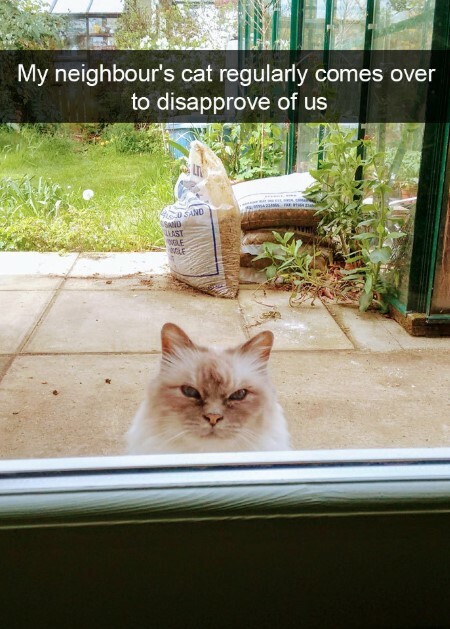 Another undisputable fact about cats is that they can be judgmental when they want to. Of course, they cannot say w thing but they don’t need to! As you can see, all it takes is a certain look and you know that you are being judged! This funny photo was taken by a person who experiences this situation on a daily basis. Their neighbor’s cat apparently visited their home just go stare at them like that which is clearly a sign of disapproval. Some photos are extremely curious despite the fact that they feature ordinary things. This image perfectly explains what we mean. As you can see, the main thing about this photo is just a lamp. However, there is more to it than meets the eye, or at least there should be, because everyone is staring at it! 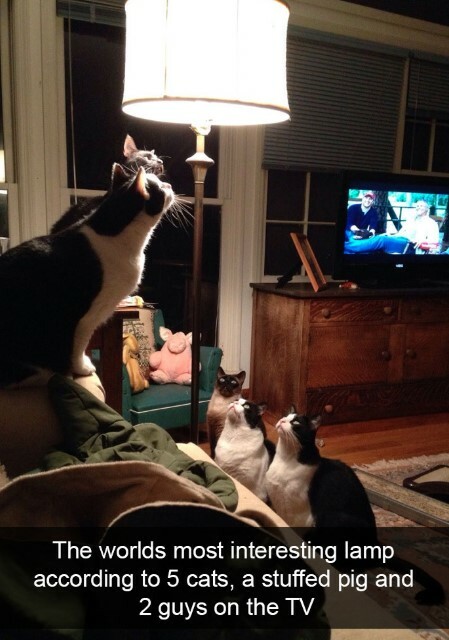 All five cats seem to be hypnotized by it! Even the stuffed pig in the bag and the two men in the back seem to be looking at the lamp, too. We guess that the photo was just a matter of finding the right angle and the perfect moment. We believe that people who love pets are not able to resist their manipulative ways. We are also convinced that cats, dogs and other pets know exactly how cute they can be when they want something. 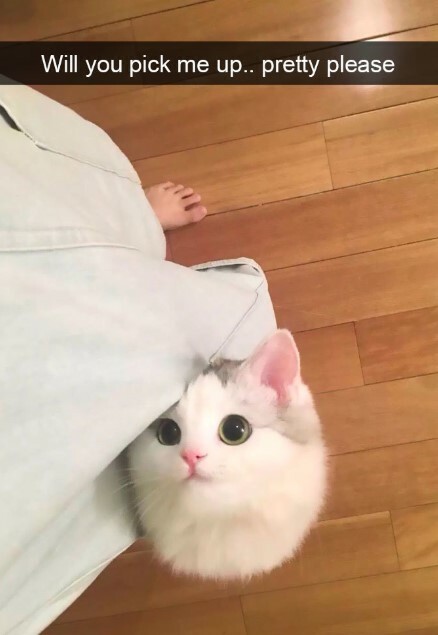 The kitty you see in this photo is mesmerizingly beautiful and the adorable look it throws at the person is definitely going to work! The feline probably wanted to be held by the human and we guess that the irresistible look was more than enough for the kitty to get what it wanted. Humans are the most advanced species on the planet and that is a fact. However, cats seem to disagree and their attitude shows it. Some cat owners were probably sure that their pet would not be able to get the better of them, but they were wrong. 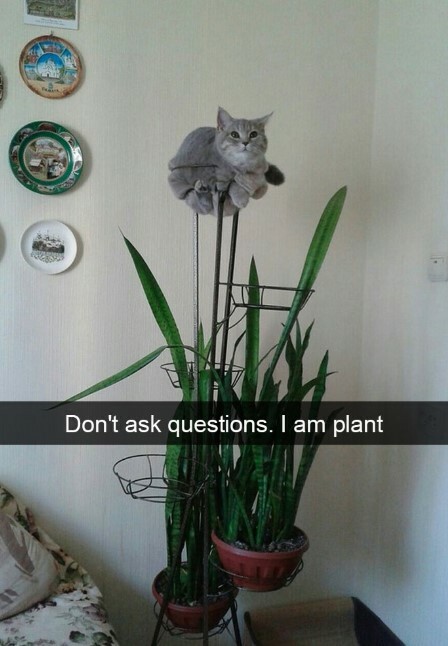 Cats are the true masters of many homes and the one in the photo is no exception. 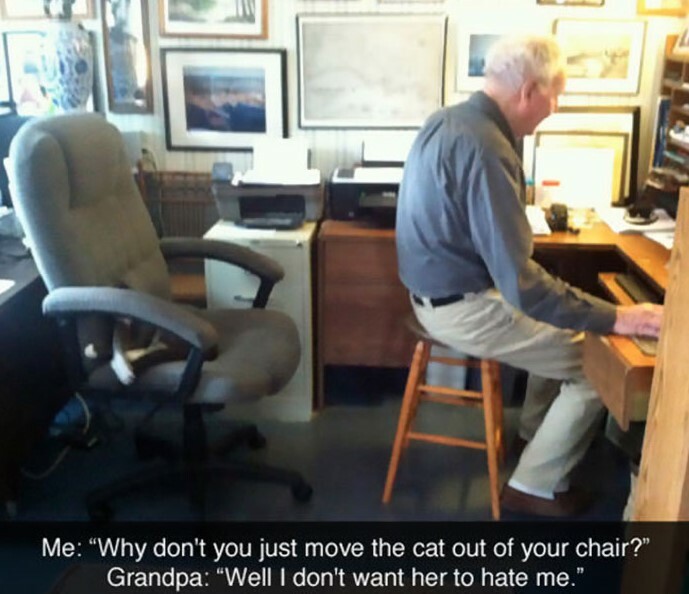 This man is obviously concerned that his cat might actually hate him so he was forced to use the uncomfortable chair so he would not interrupt the kitty’s nap. We admire people who love their pets as much as this person loves the cat. Cats are among the easiest pets to look after because they require a minimum amount of caring. As long as you provide them with food and water and clean their toilets, they will take care of the rest. 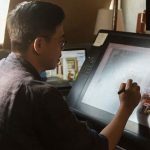 This makes them ideal for people with busy schedules. However, felines are different and some of them are real rascals. If you know your kitty is up to no good, you probably already know what it does. 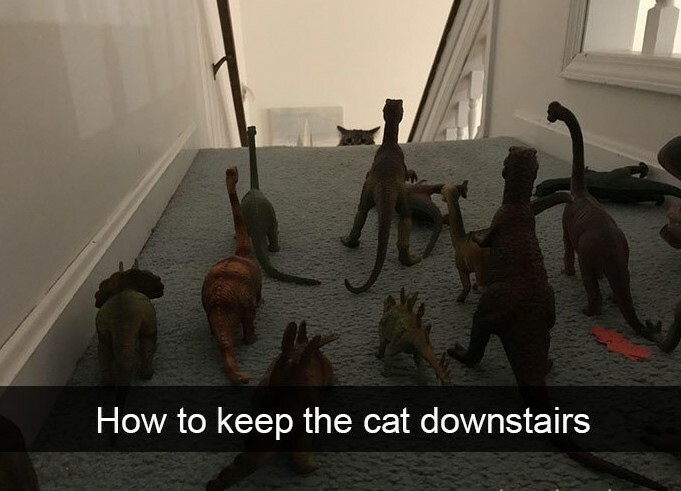 This would allow you to take some precautions and apparently the owners of this cat knew exactly what to do to keep it from getting upstairs. Most of the photos featured on list are funny but this is one is not just funny; it is hilarious! It is also really curious because it shows a rather unusual setup. There is a cat outside the window and it seems to be in a hurry to get inside. The reason is probably the huge brown bear in the back! The bear appears to be puzzled by something. Maybe the wild animal noticed the person behind the window. It is definitely not a normal thing to see but we guess that this is what makes the image unique! 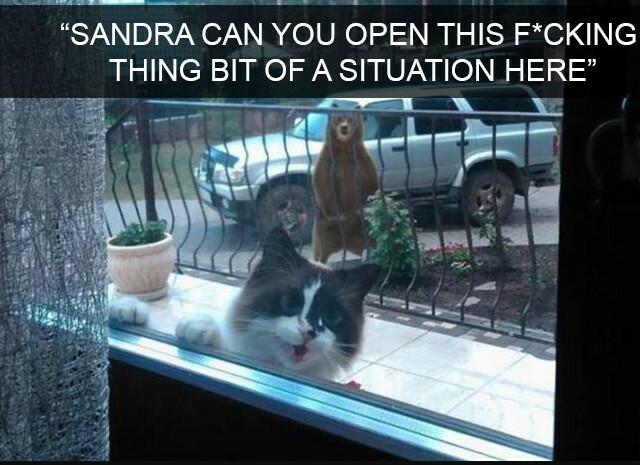 We hope they eventually let the cat in! The beautiful image you see was taken in Istanbul. The happy person you see is carrying his cat just like a parent would carry his baby. Some unknown commuter was able to take this photo and we are glad they shared it on social media. 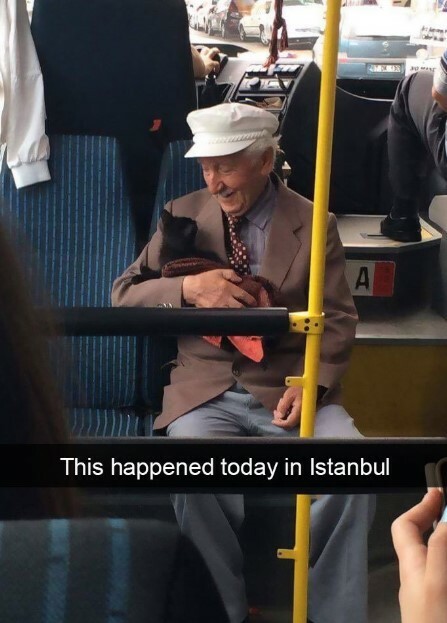 The people of Istanbul are known for their love for stray cats and dogs. Many shopping malls, markets and even cafeterias open their doors during the cold winter nights and provide shelter for them. This wonderful act of kindness is a nice example for the rest of the world. 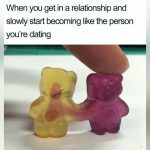 We love funny images with even funnier captions! The one you see is definitely one of the cutest cat images you could find on internet. 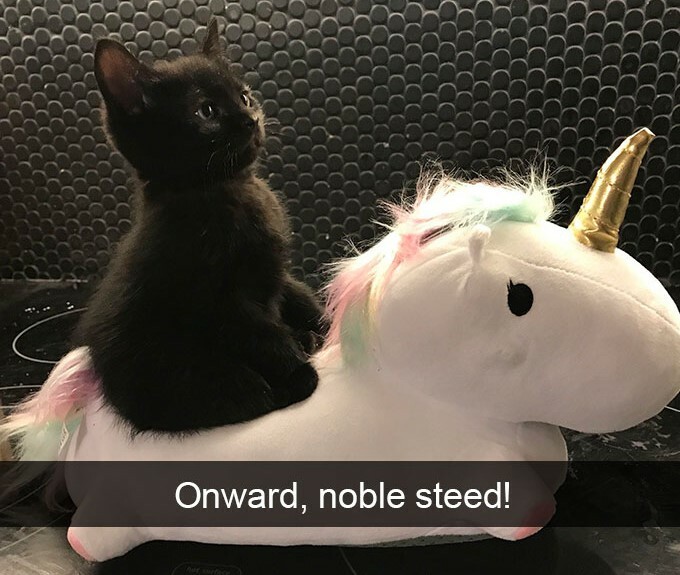 The adorable kitten is adorable and it the combo with the stuffed unicorn can melt anyone’s heart. However, it is the caption that makes this image special. Imagine receiving this snapchat! You would be laughing hard for sure! All the kitten needs is a tiny body armor and a sword! Cats are curious by nature and they tend to do goofy things all the time. However, in some cases they act just like a human would and this is really interesting to see. This is a nice example and we love about it is the simplicity! It shows a cat with a rather disappointed facial expression and we can only guess what the story behind the image is. 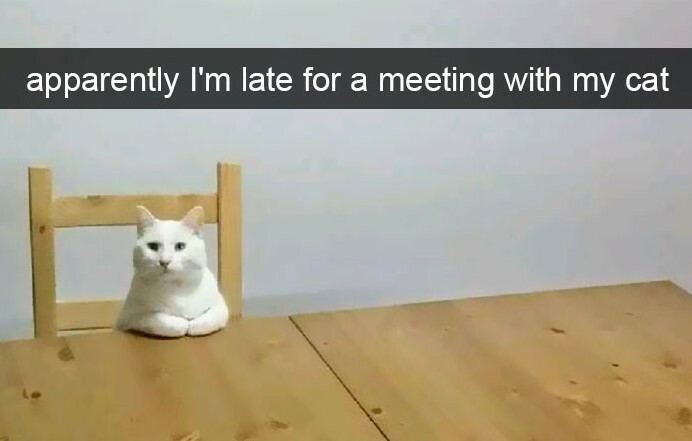 It is as if the cat arrived early for a meeting or the other attendants are late. We would never know. As we already mentioned, cats are curious and they are always wondering around exploring every square inch they can. One thing is for sure, though. Cats love to try and fit in the most ridiculous places but this particular one really made the baldest attempt. It seems that the feline finds some comfort in that position but we are not sure how it is possible to feel comfy in there. 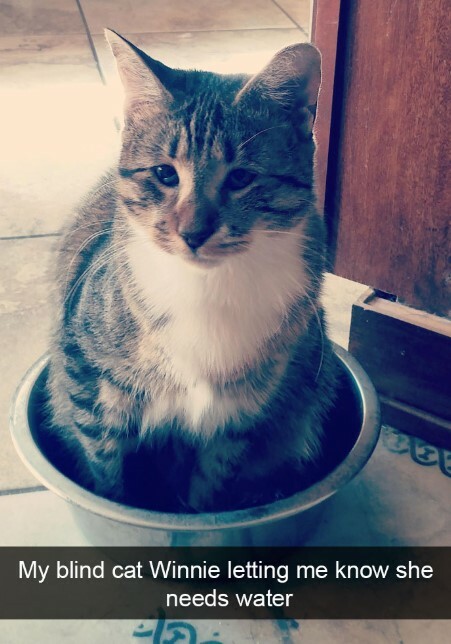 After all, there isn’t a pot for the cat to sit in. in fact, the cat pretends to be the pot! 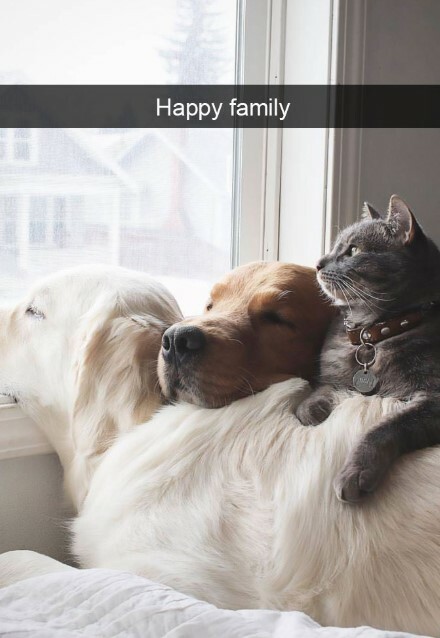 This sweet image shows these pets which seem to be in perfect harmony with each other. Of course, on them is superior to the rest and it is clear to see who! Cats have always dreamed of dominating the dog population. Even the different animated movies suggest that cats feel like the more important species and their attitude shows it all the time. There are photos which can take your breath away because of the amazing scenery of effects. However, there are also images which steal your heart despite they are not taken with an expensive camera or at an exotic location. All it takes is a stunning model, good lighting and some luck, of course. 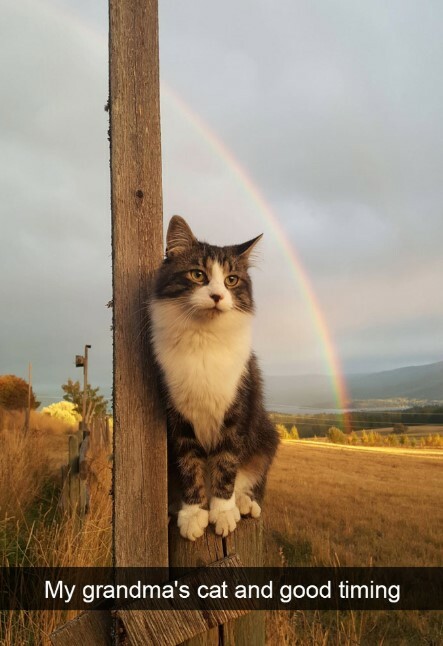 It seems that the person who tried to take a photo of their grandma’s cat was extremely lucky because the image is absolutely flawless. This sweet kitty is blind but it is not letting the disability stand in the way of living life to the fullest! Winnie has developed different skills in order to communicate with the humans. The image shows how Winnie says that the water bowl needs to be filled! This is one really smart kitty! It seems that cats have a lot of different moods and this feline is definitely feeling good about fall! The beautiful animal is enjoying the pumpkin season! As you can see, soaking up the autumn sun is probably one of the cat’s favorite activities. 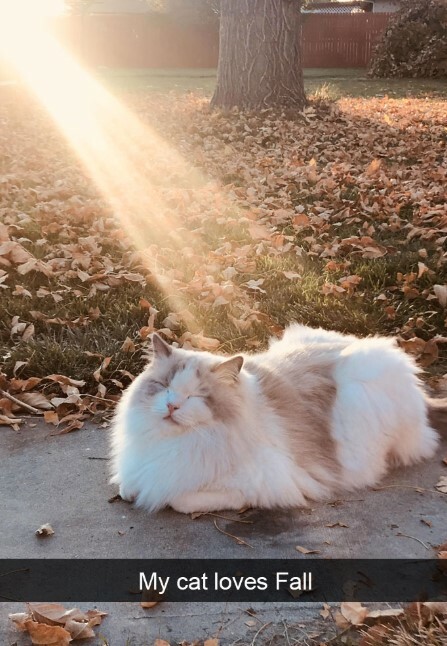 The image is stunning and the way the sunlight falls over the cat is amazing!